We had the most brilliant wedding reception at Sir Christopher Wren Hotel Windsor. The staff were exceptional, the service we received was beyond what we’d hoped and we truly had the best wedding day. Our guests loved being able to choose their meals and the wine kept flowing. We really appreciated the flexibility which the staff showed during the reception, and the rooms were beautiful. Fabulous – the answer was always yes! Our unusual afternoon tea wedding reception with chips and karaoke thrown in went fantastically well. Thank you so so much to the event planners, John, Ivan and Jorge for helping make the day run smoothly together with the receptionists, kitchen and waiting staff and porters all coming together to provide a memorable day. The room was set up for us and we were given time before the big day to decorate it. Our cake was beautifully decorated by the chef. Jorge responded positively to all our requests on the day and everybody had a fabulous time. His announcements were so warm and friendly. The only tiny point of misunderstanding was that we thought it was a help yourself buffet. We didn’t realise the delicious cream teas etc were to be brought to the tables (even better). We would have decorated the table with the cake on it much more. The room overlooking the Thames was great and the guests enjoyed the access to the bar and proximity of the loos. A big thank you to the hotel and all the staff. A good day out in a quality venue! Good food, friendly staff, and a well organised event enjoyed my all of the guests. A stunning location in the Summer. Our wedding coordinator John was fantastic from the moment he took over our booking making us feel important and helping make all our wishes for the day become a reality exceeding our expectations. A great relaxed atmosphere, delicious tea and food, helpful staff, a perfectly delivered afternoon tea wedding party. The preparation for this was brilliantly handled by John and the team, always answering any questions I had and promptly delivering everything we needed. Couldn’t have asked for more! If you’re looking for a relaxed, friendly but high quality location for any celebration or for staying in, look no further! Here for a family wedding. Everything first class except for a couple of niggles. First morning breakfast food excellent + choice, but people before us had dropped food on the floor which was not swept up. In the room, lovely old wardrobe needs a bit of TLC to the lock. Would stay again but in a different room. From start to finish our wedding was organised so well by the Sir Christopher Wren team. Pre the wedding Leanne organised everything perfectly and didn’t miss a thing. On the day Henning managed every detail perfectly. He was on hand to make sure everything went to plan … which it did. The food was excellent, couldn’t fault the service and the breakfast on Sunday was great. We made some last minute changes and Leanne sorting them out for us without any problems. We want to say a huge thank you to everyone that helped make our day so special . We will see you on our 1 year anniversary . We had our wedding reception in the hotel & the service provided was second to none. The food was excellent and Marvelous was outstanning always with a smile evenue though it was a very busy evening for him with several functions going on at the same time. Family Wedding at The Hotel. What a fantastic venue, amazing staff and excellent quality. Our wedding went without a hitch and we could not have had a more perfect day. We will always be grateful to Charlene the events manager and all the hotel and spa staff who made us feel so welcome. Nothing was too much trouble for them and we, and all our guests, noticed that throughout my stay. We had our wedding at Sir Christopher Wren Hotel on the 22.07.2017 and from start to finish it was the most perfect day and we can’t thank the team enough. The service provided was exceptional, from the waiters to our master of ceremony to our wedding co-ordinator. With the help of Seventh Heaven our flower and wedding decorator supplier the rooms where stunning and all of our guests commented how wonderful everything looked. Each and every member of staff we had contact with was a pleasure. Nothing was ever to much, each had the time to stop and speak to you with genuine interested. We are so lucky to have had such a wonderful day and Sir Wren will forever be in our hearts. The staff at The Wren in Windsor are second to none- they went above and beyond to make our stay absolutely perfect. The team managing the wedding (Charlene and Marcelo) were just so understanding and wonderful – they thought of every detail and made sure that we were happy at every turn. It was difficult when the works were announced (changes to the function room we booked) but they also managed this in an effective way and made sure we were notified of changes. I would also add that the food at the hotel is wonderful! We want to thank the whole team for their help to make the biggest day of our lives a fabulous experience. 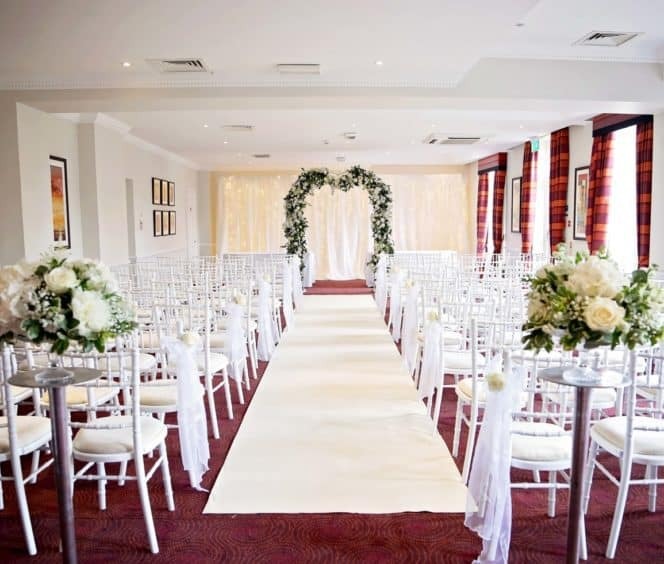 Make an enquiry below and a member of our Weddings team will be in touch. Alternatively, call +44 1753 442400, email wrens_events@sarova.com or visit during one of our Wedding Open Days.